.. statistical mapping & visual data analysis … ready-to-use GIS projects/datasets … Geographic Information Systems (GIS) provide flexible and powerful capabilities to combine maps with data. In our increasingly data rich environment, we often experience “drowning in data.” GIS tools can help harness disparate and voluminous data and assist with data linkage. This section provides links to other sections that provide information on no cost GIS software and “production” GIS projects and datasets that you can use. Make this type of view/map for any area. Click graphic for larger view. 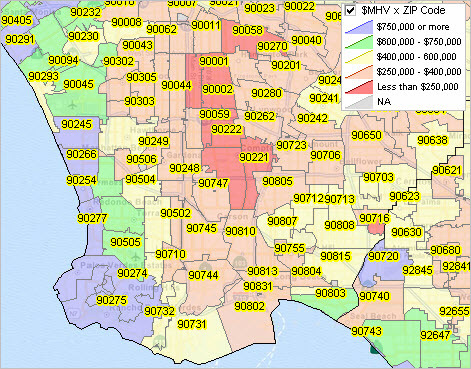 Larger view illustrates use of identify/select tool to show mini profile for a selected ZIP code (see at pointer). Expand browser window for best quality view. Using GIS resources described here. Join in … participate in the weekly Data Analytics Lab sessions to discuss more details about accessing and using wide-ranging demographic-economic data and data analytics. Learn more about using these data for areas and applications of interest.